At the start, the hall door would not open. We waited, not impatiently, for the day was warm, the morning sun causing the leaves on the stucco to glow a burnished red whilst, from afar, a church clock chimed the appointed hour. Before us the grass, long since having encroached on to the carriage drive, had been newly cut, the mowing machine standing idle since our arrival. And then we were in. The Kastély, which we should better describe as Kúria [manor house], is much earlier than previously thought. Here is an early eighteenth century yeoman's house which, some hundred years later, had been remodelled in the fashion of the period to produce a neo-classical facade and to provide an importance most fitting for a lord of the manor. A broad sunlit entrance hall, running from front to back, affords access to the ground floor rooms. Those at the front, a Morning Room, Dining Room, and Study have a somewhat ecclesiastical air, no doubt suggested by the arched window recesses and vaulted ceilings. To the rear a series of what in estate agents' parlance may be euphemistically described as the "usual offices" could, with heightened imagination, become kitchen, scullery, pantry, game larder, laundry room, even servants' hall, should they ever be to hand. An unusual spiral staircase, closeted behind Normanesque pillars, gives rise to the first floor and the spacious, south facing 'piano nobile' or drawing room whose three rounded windows afford not only views of the grounds below but also of the distant countryside beyond. From this room open the principal bedrooms, one with a trace of an elaborately painted ceiling, dressing rooms, and future bathrooms(? ), whilst beyond is a dismal rabbit warren of who knows what which could so easily, here with a vague wave of the agent's hand, convert to the most charming of guest accommodation. Once more outside we stroll the policies: a neglected orchard here, there a dense shrubbery, beyond the suggestion of a one time kitchen garden. Moles, their tunnels radiating in all directions, play havoc with the lawns of old, rabbits graze undisturbed. Time stands still. And should it be that we ignore the damp, the dry rot, the possible subsidence, the leaking gutters, the blocked down pipes, the toppling chimneys, the glassless windows, the ill fitting doors, the falling stucco, the crumbling plaster, and the ghosts of those long laid to rest? We do so at our peril. Today we seek a surveyor! Good morning Jane and Lance! There is this grand atmosphere this mansion has and so much potential! But I think you are doing well to seek a surveyor! It would certainly mean loads of work but also an exciting project. Again I keep my fingers crossed and I am already curious to read the next chapter! you'll have you work cut out for you, but if it's the only house you want, that in itself will give you cyclonic energy. Yes, it's a venture for the brave or foolish. Are you near a coffee shop? Do the grounds require as much work as the house? Can your cook go with you? I am gulping a little bit...I would hate to see you in a few years' time eking out an existence in a caravan with a gas ring and a jar of Nescafe, all because of a little mis-judgement. But I say, how fantastic to even consider it, and if you do go ahead, may all be splendid! Argh...I am so excited for you both and hope the surveyor sees positive things! It really is beautiful and so grand. Spoken just like someone who doesn't have to deal with the dry rot and damp I suppose but I know you would really treasure that beautiful home. Good luck with the inevitable tsk tsking of the surveyor! Annie x. This is an exciting prospect, can't wait to see where it leads! Yes, as you so rightly surmise, the amount of work required is somewhat daunting and, putting aside the romance of it all, we must be certain of the affordability before we embark. However, it is all very exciting - as if excitement were needed! Oh, Faisal, could it be that we may be reduced to the caravan in the grounds, a gas ring and a cup, no worse, mug of Nescafé? Many a true word....! Yes, the gardens, as you may imagine, are in a sorry state and would require starting from the beginning all over again although we should be less ambitious than in the past. We are older, of course, but it would appear none the wiser. Tímea would, we should hope, be persuaded to come with us and we have thought of employing her husband to act as gardener [a job which he has] and handyman. Whatever, all must now wait on the surveyor. The amount of work required to be done is fairly forbidding, most of which we tend to skip over in our minds preferring to imagine the rather more fun things such as paint colours, curtain material and such like. You, we are certain, would be in your element with ideas. We are so encouraged by your optimism but it may well lead to our undoing! And can Hungary ever be as lovely as Italy? I think I have Hattat House fever! The very first thing I did upon waking was to see if the post was up. Oh my goodness, the photo of the manor in the sunlight took my breath away but then again so did the "bathroom". Uh, oh. But that parquet, the "piano nobile", oh my just so incredibly lovely--I admit that I could see the final product with the rugs down and the chandeliers up and it was gorgeous! Dangerous to think about perhaps. But, then again, yes, one step at a time. For this does seem rather monumental. I am hoping that you know an excellent surveyor. Here in Provence, we would have to call at least two as their opinions and prices vary so widely. What a lovely way to start the day--with a dream! That said, I was so very sorry to see in the comments that you have been with ill parents while away. I am sending my very best wishes to you both. I raise my coffee towards Budapest! Your comment, dear Heather, is so very kind and generous and does indeed touch us greatly. In return we raise our coffee cups this morning as we breakfast to Provence, and especially to you and Remi. We too are in danger of living the dream - soft furnishings, where to place pictures, paint colours - as opposed to facing the reality of serious cracks in the walls and foundations which may, at best, prove to be shaky. Hopefully we shall keep our heads and rely on the professionalism of others. I am rather taken with the staircase, as indeed I am with the whole building. I would happily live in a caravan for the rest of my days so long as it looked out on such a splendid house. I will keep all my fingers crossed that the project is deemed viable. Notwithstanding all the work that would need to be done, and its looking truly magnificent in the daylight (and sunshine), doesn't the thought of being in a place like this AT NIGHT spook you at all? I'd be freaked out whenever darkness falls, hearing strange sounds, wood creaking etc. But that's only me. Then there's the security aspect. When my National Lottery jackpot winnings cheque arrives I'm going to get myself another apartment (two bedrooms, of course) - with (very importantly) sympathetic neighbours. Modest ambitions! Hello Jane and Lance, The exterior and grounds look magnificent. 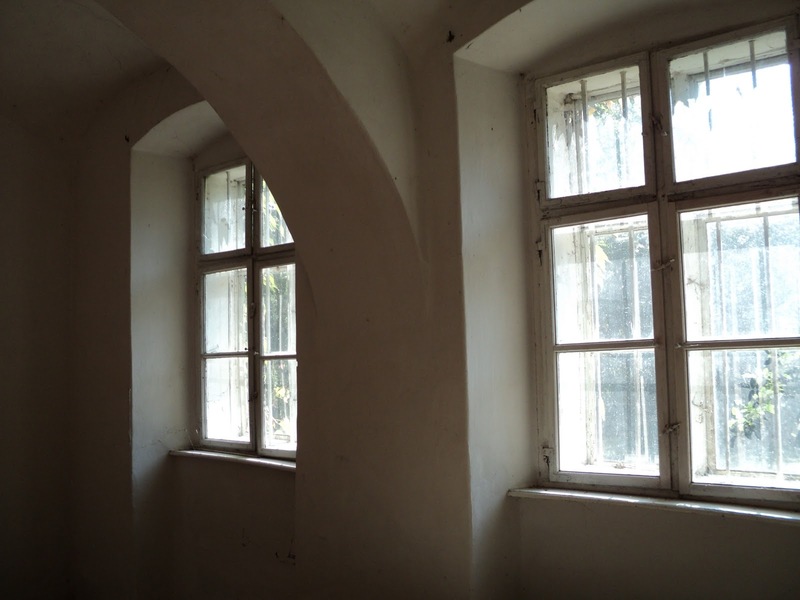 The interior looks large and sunny, but I wonder how many architectural features are there. That can be good or bad. Replacing, say, hand-carved moldings or ceilings can be expensive, but original features are (to me, anyway) a big part of the charm of old houses. I wonder is that spiral staircase the main one? They look charming, but those winders (tapered treads) are dangerous and I find spiral stairs vertigo-inducing in general. The staircase is even better when viewed from the hall where, supported by chunky pillars, it appears very impressive. Unfortunately the depth of the treads is rather shallow and we should, ideally, wish them to be wider. We do agree that the front facade has the power to enchant. No, as it happens, we are not at all alarmed by the dark or, indeed, being in a relatively isolated spot. When we lived in Herefordshire, where we were for twenty-five years, not a single light could be seen at night and we rather liked that. Now, give us a mouse or a spider, let alone the loose cannon of a bat, and we are terrified! We are keeping our fingers crossed for your monster lottery win although statistics would suggest that you do not hold your breath waiting! You have, as we should expect, cut to the quick where this house is concerned. What drew us, some years ago now, to our Budapest apartment was that it had survived the years of Communism, although in multiple occupancy, with all of the original features more or less intact. This house is singularly lacking and much research needs to be carried out to ensure that whatever is done is executed appropriately and in keeping with a building which is a mixture of the C18 and C19. The spiral staircase, which is the principal one, is, as we have made mention to Ben [above], not as wide as we should wish and certainly needs to be mounted with a degree of care. Oh dear, you have really set us thinking for which we thank you for it is no bad thing. We much appreciate your keen eye. I looked at your link today and though - oh golly gosh (or words to that effect) they've bought the Kastely! And then I saw all the pictures all that is there to entice and understand that awful balancing act in which the head and the heart are engaged. I hope it won't become a battle. All the very best - can't wait to hear the next installment. 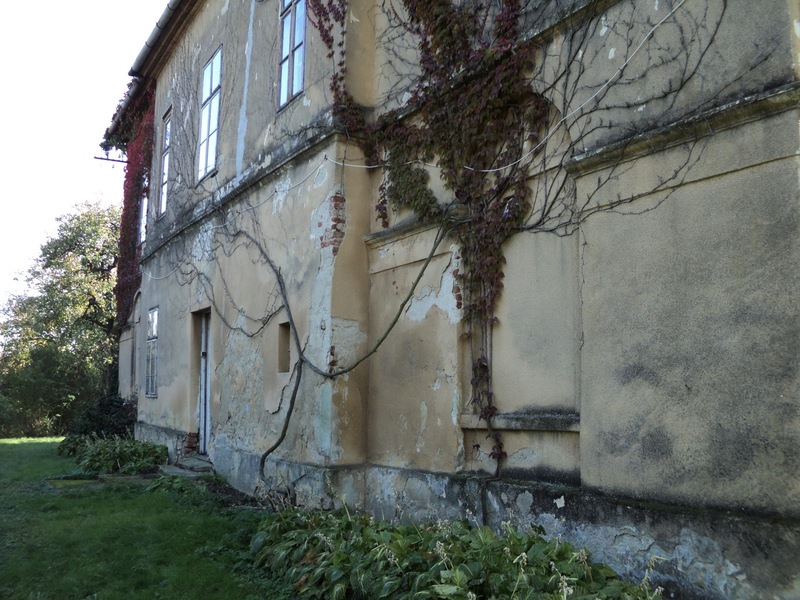 It's so very beautiful and wildly romantic, the exterior really is an ivy clad dream, fingers crossed on the survey. WOW ...... what potential there is. From the grand facade, to that beautiful spiral staircase, to the lovely double doors throughout. Here's hoping that the surveyor is positive and that things can progress to the next stage. We love this, previously unknown to us, quotation which we trust we may have the courage and vision to adopt. Oh, what a lot of character and potential that house has! Best wishes on your decision. Thank you so much. We think that we shall most likely need it, that and good judgment. You are so right when you speak of that balancing act between the head and the heart and which, as you will so clearly know, we are engaged in at the moment. Always, somehow, much more difficult in a foreign land where the temptations are so much greater. We shall now see what we shall see [as they say]! It is, as you point out, the romance of it all, something which we find so very enticing. The dawn of reality will, doubtless, break with the surveyor's report. Goodness gracious, my dears. I hope your surveyor will be of the dry, meticulous, thorough sort. A rambling ruin to furnish you with employment for workmen of all kinds to the end of your days. Perhaps you'd best import them from Germany? A wonderful project and a nightmare at the same time; It seems I have completely the wrong impression of the two of you. PS: we have reached the age where we are thinking of what is commonly called 'downsizing'. You are so kind and generous, Jackie, and so very encouraging for we do, in fact, go through the torments of the damned as to whether, at this time of life, it is wise to embark upon another major project. And to think that for more than a quarter of a century we were content to rusticate in rural Herefordshire! But do we have the stamina for it? Brilliant. Lovely lovely LOVELY house. The house is magnificent, but in all honesty that staircase would terrify me if I had to traverse it everyday! If your surveyor is hesitant will you easily let go of the dream now I wonder. Here's hoping any problems he finds have straightforward and affordable solutions. Now you know us for the fools we most likely are. Our greatest fear this morning is that once surveyor is found, and has reported, we are in danger of brushing aside all of the most damaging details to concentrate on whether or not we should demolish an existing, and deemed doubtless unsafe, dog kennel, or some such. As for the 'downsizing', we see this as retreating to one room and knitting woollen mittens and drinking 'Cup-a-Soup'. We feel, somehow, that the blog posts charting the renovations will, in reality, be an account of visits to the nearest cash machine! I've been lost in a romantic daydream since looking at these photographs. If love is blind, maybe I've fallen in love with this place too. I see not endless graft, paperwork and obstacles, but elegantly dressed guests enjoying a party. Not workers filling skips, machinery loudly roaring and gaping holes waiting to be repaired, but a contemplative Jane and Lance looking out onto the gardens, book in hand, music softly soothing you as a feeling if warm contentment washes over you. I'm a dreamer, so an undertaking such as this would be 'right up my street'. I'm so looking forward to the next stage. I do hope you're able to continue trying to breathe life into the soul of this beautiful place. This is the problem for the house does, of course, look so utterly romantic and charming - or at least so it does to us. As for nerves of steel, at present ours are rather more akin to soap flakes. The staircase is, in fact, something of a disappointment for we should, ideally, wish it to be far grander and, if that is not possible, then a little safer. At present it does somewhat resemble a death trap - but nothing to the attic stairs which are too frightening to show. Oh, Lucy, we adore the picture which you paint here and which, so foolishly, we completely and totally identify with. Your enthusiasm, your encouragement are so much appreciated, and so much what we wish to hear, but, sensibly, should we not be concentrating on the roar of machinery and the filling of skips which, in the hard light of day, translate into pounds sterling or, in this particular case, Hungarian forint? What a beautiful home, even in this miserable state, has lost none of its glory. For someone with courage and strength will this house paradise on earth. You know nothing about history? Have a nice day my friends! It is most certainly, as you say, a very attractive property but will take a great deal of work to turn it into an earthly paradise. Yes, we have managed to find out several things about its history before it was taken over by the State during the Communist period. I have never bought a house, so I am entirely unqualified to offer advice on the matter. It is, however, utterly magical, so please buy it on behalf of us, your adoring readership, that we may live out our country mansion fantasies vicariously through your efforts. Many thanks. Just possibly we need you here, right beside us, Susan, to talk some sense into us. Some time ago we gave up on 'stress'. What are we thinking of now for this is surely going to be a little more than a walk in the park or feeding ducks on the pond?! What an absolutely lovely thought and such a kind one. It is, of course possible, and here we are being realistic, that there are those amongst our readers who would not give a thank you for it. And they are, perhaps, the wise and sensible ones. You are so very kind. Like you, on the one hand we really believe that it can become a fairy tale castle, where we live happily ever after, and on the other a bottomless drain of our money where we end up dying in abject poverty. Most likely the latter! After the surveyor had cast his expert eye over our property, and knowing our determination to purchase, we were met on the drive with his words, "You are brave". Be brave Jane and Lance.... be very brave! I think it looks like a wonderful project. Most things can be fixed and with the help of a good architect it will become a magnificent residence. If, on the other hand, dry rot has taken hold - then the battle may not be worth the fighting. I do hope your surveyor brings good news. It is very lovely, or at least, it has the potential to be very lovely again. If you really want to devote the rest of your lives to it, it would be a wonderful project. But you have, or it seems to me that you have, a life that you enjoy very much, and you would have to give up so much of that to plan and supervise the project. Do you really want that? I really would be concerned about that staircase, as well. 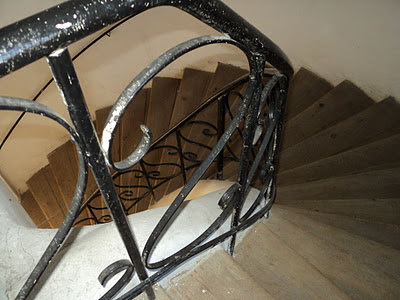 It is odd that such a narrow twisting staircase is the main one in such a fine house, but maybe that's typical in Hungary. When my parents-in-law bought the house I now live in, in 1928, there were only Tudor winding cupboard staircases and they sacrificed a room to put in a hall and wide stairs. If you go ahead, could you add another staircase - or, perhaps, put in a lift? What a lovely and so encouraging comment, Abby. You really are the kindest of people. We are, as you may imagine, torn in all directions and much now will depend on how serious are those problems which we can see for ourselves and those which may, with professional advice, be unearthed. You pinpoint here, Anna, the real crux of the matter. When all is revealed, will it be a battle worth fighting or should we, if the odds are strongly stacked against us, retreat only to sally forth in a different direction?! Perhaps the Ukraine has something to offer in the way of real estate?!! Thank you so much for this very wise and sensible comment of the kind which we do, indeed, need to heed. Of course if the project is beyond what we can afford to have done in one fell swoop, then we should leave well alone for, as you say, we do not wish to devote our lives to the practical side of restoring an old building. Our Budapest apartment was a similar project not having been touched for fifty years, but the renovations were complete within six months with an excellent team of work people. The stairs are something of a killer and will need careful thought. Your own house sounds wonderful and how splendid to have enjoyed it in your family since 1928. The removal of the cupboard staircases and their replacement by your parents-in-law does seem to have made sense. And besides, houses are organic and cannot be preserved in aspic. What a wonderful opportunity to awaken a once beautiful house and then enjoy some truly gracious living. To me the platitude that springs to mind is "where there's a will there's a way", and if you have good advice from the professionals, willing and able workmen, and the means, then surely this is indeed possible! I keep my fingers crossed for you once again that the project is feasible for you as this looks a real treasure. What a wonderful and exciting project to get your teeth into! I love how the facade of the manor looks. It is very stately and needs just a few little magical transformation. 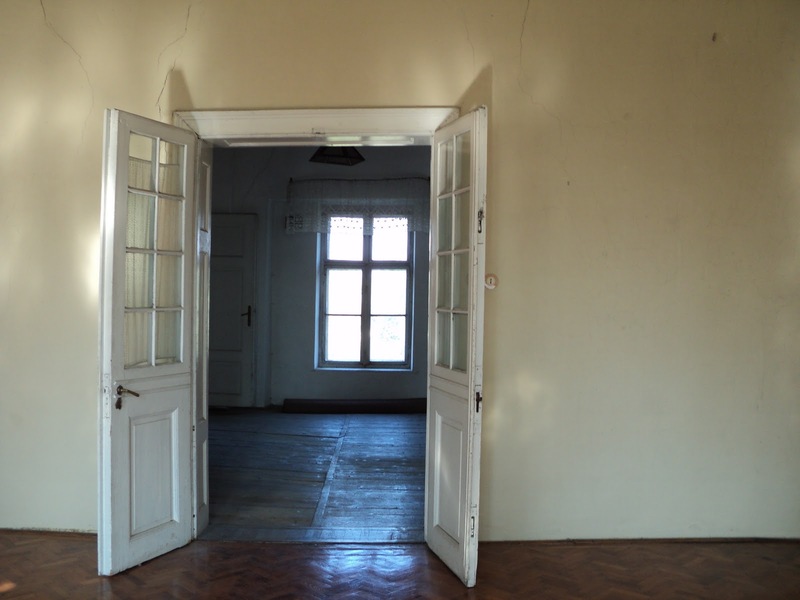 But I am excited of how you will renovate the interiors of this lovely place... I am quite excited to see how it will all turn out. Such an exciting adventure for you. You must be enjoying the 'journey' and the planning even if you eventually decide not to go ahead with the project. Good luck to you both. We are so encouraged by your thoughtful and kind comment. The house does, as you suggest, represent a really interesting and possibly very worthwhile project. Much now will depend on a professional opinion which is, at least where we are concerned, a good thing to prevent our being swept along on the outgoing tide and then, horror of horrors, lost at sea. So exciting but the amount of work to be done looks way beyond anything I would like to take on. If you should go ahead, if the surveyor gives an OK, I think you will need servant quarters, just think of all the house work!! How really kind of you to be excited on our behalf. The possibilities are almost unlimited and we are spending nearly all our time at the moment considering them. One moment one idea, the next another. Yes, you are so right about enjoying all of the initial planning. Possibly this is because, as of now, the final commitment is not yet made. Thereafter the stress begins! As far as we are able to tell you do not appear to have a blog. If you have, do please let us know as we should be delighted to follow it. Whatever, your comments are always much appreciated. We love individuality, however it is expressed, and so your opinion of the staircase, whilst being in a minority, is extremely valid and valuable. Now, a Swiss made lift or escalator. Could one want anything better? We shall get on to Messrs. Schindler right away! Thank you so much for your continued interest in all of this. Such potential, Jane and Lance, but also a great deal of work and expense. That degree of neglect won't be easily remedied, but the house does look as though it would be worth the effort. A surveyor is definitely the next step. I shall look for updates with great interest. Diane, a voice of reason. Oh, if only we could meet and we should listen as you would, we know, advise so wisely. Creating an office in the upstairs of the barn sounds wonderful and perhaps it too will become a project for the blog? In the meantime, we do so hope that the trauma of the move is going to plan and that you are both not too exhausted. Thank you. How very kind. But, fear not, everything has its day and already those 'Swinging Sixties' are becoming hugely fashionable. We suspect that your house may already be a period piece. This adventure is a blog in itself---I can't wait for the next installment, I have a weakness for old houses, no matter how dilapidated...good luck! And where shall wisdom be found? Not, we fear, here in Budapest at the moment and the lack of it may well be our undoing. We too wait on the next, critical stage during which time our minds continue to float free. You are right, Sue, it is the fascination with old houses which makes it all so dangerous. We do hope that the saga is not going to rival Agatha Christie's 'The Mousetrap' which has had an unbroken run on the London stage for well over fifty years!! Goodmorning Jane and Lance.This looks like it could be awesome,cant wait to see the end results.How fun this must be. I am nervously excited. You will have to deal with things so foreign to me, such as boilers and radiators. The stair case does not seem suited to the house, but what a nice staircase. Ah well, I suppose you don't have terribly dependent heirs and it would be quite an achievement. Let me guess what the surveyor will say: This will cost quite a bit but the house is sound and it is worth it. Should you embark on such a project, I hope it does not take away your blog time. Dear Linda, how could we not have taken pictures to share with everyone? And, it is surprising how, when one looks at the photographs afterwards, so much is revealed that one overlooked at the time. We have many, many more images that were unshowable!!! Thank you for your confidence but this project is seriously testing our nerve. A final decision, however, whether to proceed or not must come soon to preserve what is left of our sanities!! It could be wonderful. It could be our worst nightmare. That is the crux of the problem. After owning a "fixer-upper" (aka, the money pit) in Connecticut, we vowed never again to buy a major fixer-upper (and ours was nothing compared to this). We then bought either brand-new or perfectly maintained. We have since spent several years down-sizing and are loving every minute in our manageable and totally modernized 3-bedroom flat. However, I would be tempted -- in a heartbeat -- to take on this place! What potential. What beauty. What stories! Thank you so much for sharing this all. I hope the survey goes well. I don't think I could do it again (besides, that nest egg is long gone), but I will live vicariously through you! If you are nervously excited, just imagine how we feel!!! This project would certainly take us way beyond any comfort zone which we have enjoyed in the past. 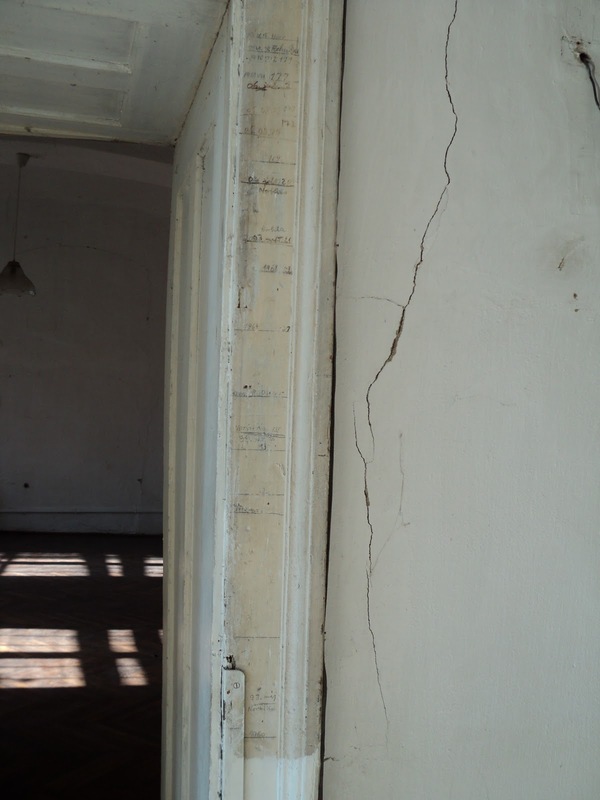 Boilers, radiators, subsidence, crumbling floorboards, peeling plaster....yes, we have dealt with it all before. But, somehow, this house still daunts us and yet excites at the same time!! What a sweet comment, for which many thanks. The Kastély is certainly, by any definition, a 'fixer-upper', although we can see more of the 'upper' about it than the 'fixer'. 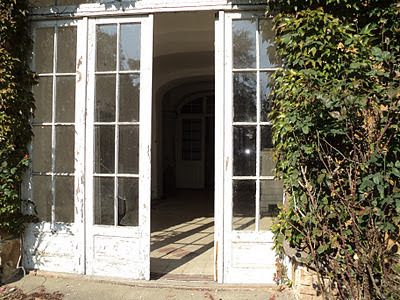 Having been lived in for many years by five families, this house will take more than a little TLC to restore. And yet, as you say, just a heartbeat away is the charm of it all. 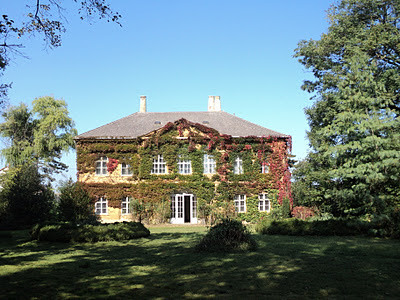 The splendidly sunny south front, the perfectly proportioned 'piano nobile' and just a hop, skip and jump from Vienna. How can we resist, and, yet, how can we live to tell the tale? Old houses have a way of sucking you in with their history and the romantic vision of "what could be" once rescued...but my goodness that is a BIG old house! How much work you need to do depends on how you wish to live....if you are able to live with a bit of decay and not worry about getting it all perfect...great, it is a truly beautiful place. We could not agree more. It is so easy to get swept up with it all without paying sufficient attention to the basics. Boring they may be, but we feel that we ignore them at our peril. As for living with walls not square and the odd bit of peeling plaster, we can certainly manage that.Indeed, we rather welcome it. But, sitting in the cold in a Siberian winter would not be our idea of fun! oh my fingers and toes are crossed. what a place! Fingers, toes and a good deal else, including cheque books, need to be crossed, we fear, to make this project viable. Seducing, though! Interesting hybrid of a house, isn't it? I'd love to see it 'in the flesh'. I wish I could send you our Turkish builder...better than any surveyor and very upfront about what could and could not be done - a wonderful mix of professionalism and enthusiasm. There is so much potential there.... with the right love and attention that could be a palace! Yes, absolutely, a veritable mixture of styles, regimes, influences and periods. It makes for both interest and challenge. Essentially, the rooms are in an 'en filade' arrangement which is so usual in this country and is what we are used to in our present apartment. This does, however, always pose problems we find of separating bedrooms and, as a result we can only see three bedroom accommodation out of the rabbit warrens that exist at present. Oh, how we should love to have the services of your Turkish builder with his winning combination of know-how and excitement. Perfect! We love your optimism. Oh, a palace, well that seems a little way off from where we are looking. Still, we shall see. Miracles can happen or so we are told. I surmise from your last statement "Today we seek a surveyor" that you have not discounted the idea of this beautiful manor! I am afraid I would be no help if I were there with you as I always jump feet first. What an adventure, one I could not turn my back on, I would have to proceed. I hope one of you is less impulsive! Well, we usually think that we are the ones with rose tinted spectacles, but, Arti, you seem to be the romantic here. Relaxing and comfortable are not words that sprang immediately to our lips, but an eye-catching entrance, that we should most certainly agree with. Perhaps, Dianne, you might be less impulsive if you were to see the full extent of the damage! We have never employed the services of a surveyor previously, so that is maybe some measure of the coldness of our feet!! Ooooh! Only you know if you have the appetite for the hard work this will need. But if you can rise to this challenge you will have the most wonderful, beautiful house I could imagine. And you will save it for future generations. Magnificent! oh, what lovely rooms. and the staircase!!! i can see why you can't let the dream go without investigating just how severe the issues are. i can only imagine what an adventure this will be. Okay, right here-- I am hooked! And what a grand payoff by the end! To me, this seems a delicious undertaking were one to have the time, funds and imagination to see it through. I am now envisioning the photographs in the years to come of the realization of such dreams! I feel very, very excited for the two of you!! Thank you so much for sharing your pictures as well as your first impressions of this beautiful house. I've just come in from walking around my own house with my "Handyman", well he is the fellow who looks after all manner of fixing things for us and has for many years. I've noticed new cracks this summer in our brickwork and I have been quite worried that our house is actually falling down! Apparently it is not as bad as I thought and our fellow assures me those cracks were there before. I just didn't notice. I guess my thought is that the condition of this place may not be too awful, and the biggest work might be to install the bathrooms and kitchen. Oh and convincing your cook to come with you should you move! Looking forward to reading all about what the surveyor has to say. What a truly beautiful house. Anyone can see how fabulous it would be with some time and money spent on it. In my experience, if it feels right, the effort will be worth it and a time will come when all the inevitable problems are forgotten. It's lovely. I would love to live there myself. An appetite, most certainly, but would we be biting off more than we could chew? Not knowing at this point, we cannot say, but it is certainly exciting thinking about it! What a beautiful building. 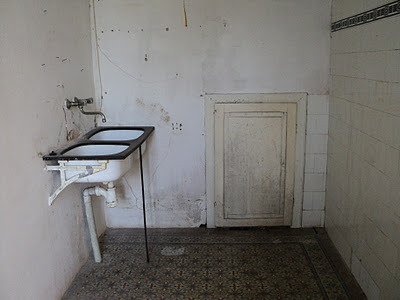 Yes, you will have lots to do, but i would think that making this space into your home will be a well worthy cause. Good luck with the surveyor, and enjoy the adventure! Will our heads win over our hearts, that probably is the question? Still, we do firmly believe that following dreams is never easy and usually there are many obstacles in the path. Well, now that you have agreed to take care of the ghosts, that makes all the difference!! Such a balancing act we feel that this all is. We have never undertaken anything in life that we have not seen through to its conclusion but, this time, our nerves are barely holding. Perhaps that is the answer right there! My dear departed papa, late of Cluttons, would have been able to write an astoundingly hair-raising report on said property. That aside, I think you should go for it if you can possibly afford it. Then you could write a splendid book like a year in Provence etc. and pour all the money back into making it a veritable Hungarian Eden. We once bought a 500 year old mud brick house in Marrakesh..........and survived. I'm all excited for you. Do, do keep your eager readers posted. We do so agree that cracks of alarming width running the full length of walls really does make one nervous. We are relieved, however, that yours seem to be merely superficial. We are rather of the mind that those inside and outside the Kastély may, sadly, be rather more significant!! We absolutely go along with you about the 'feeling right' and in every previous project that is exactly what we have done. For some unknown reason, this all seems different. Perhaps because it is so far removed from any previous experiences and is, of course, in a foreign land, it all appears so much more complicated and daunting. We really should love to 'save' this house but are just not sure whether we have the personal and/or financial resources to do it. Such a tricky balance but at the end of the day perhaps one just has to leap in or leave well alone and suffer the consequences. Such a kind and encouraging comment, for which many thanks. We are feeling at the moment that our blog posts on the Kastély are rather turning into some kind of novel with a life of its own. It would appear that not only have we been beguiled by this Ivy clad beauty, but so have our readers too. Gosh, how brave of you to take on an ancient mud brick house in Marrakesh. Now, that is an adventure, the Kastély seems almost a trifle in comparison. Just how does one start about restoring 500 year old mud?!! A film!! Oh yes, we can see it all now, Barbara, as we the Brad and Angelina of the whole affair pose moodily and in profile for all the close-ups!! Now we are afraid, very afraid!! What fun to come along on the tour. Some lovely features and yet there is the practical side to consider. Such history and future potential. I hope you will share the surveyor's perspective with us all too. Thank you both for your sweet words on LAWN TEA this morning---it was just a little memory, but a vividly pleasant one---as are all my impressions and memories of England. And the anticipation of your REVEAL---the reality is so much more than the dream. Those recessed windows, the arched ones, the nautilus of stairs, even the dumpy little laundry-gate and the bathroom straight from the Periculo scene in ENCHANTED APRIL---I had tears for a moment just absorbing all the parts of that magnificent place---the shine of those floors even beneath all those lost footsteps and that height-measure! How DID they leave that behind? (Our own is a plebeian sort, on the side of the fridge, but I swear to get out a cutting-torch and retrieve it when old Westinghouse breathes her last). All the memories, all the feelings---I cannot tell you. I'm so happy for you both, and hope the surveyor's opinion is even half of my own. Potential we agree there is in plenty, but our capacity to realise it we doubt. We wonder whether we have lost some of our sense of adventure or whether it is the wisdom of our years? It's hard to find just a single word to describe this amazing house...but magnificent comes to mind rather easily! I enlarged every photo to see the details you so carefully described. I think it would be a fascinating project and one that many craftsman would love to work on...I would think. A home with so much history is intriguing to say the least. Seeing the photos and the herringbone floors you can just imagine the dinner parties and holidays spent inside this home. I can imagine how beautiful it would look in candlelight and sconces. I love the last photo showing the heights of previous occupants. I can hardly wait for your next post! Your sweet words, dearest Rachel, have touched us deeply. The 'nautilus' of stairs, oh how we love that description which does so aptly describe that tight spiral of wooden treads connecting the floors. We can identify so well with all that you write here. The Kastély is indeed imbued with a sense of so, so many different lives which have been lived within its walls that one cannot fail to be caught up with the romance of it all. And yet, although we generally shy away from the 'sensible' we know that so much needs to be done to realise the dream of that sleeping beauty of a place. We too should have removed the height chart and fully approve of your taking a blow torch to the fridge when the time comes! What is very fortunate about undertaking such restoration projects in Hungary is that there are so many talented craftspeople available. We had experience of this in the renovation of our present apartment and were constantly amazed at how skills long lost in England were alive and well in Budapest. Dear Jane and Lance - I have enjoyed this posting immensely, and I've taken the time to read all the cautionary comments, too. All the naysayers worry for your sake because they love you, and those who leave positive comments embrace your dream for the same reason. I think that if you're ready to live up to the challenge, and you have a clear vision of the completed manor, all the right people will come your way to manifest that clear image. It had beautiful proportions...I shall keep my fingers crossed that the surveyors reprt is not too scarey. Mark, how very kind of you to say such lovely things. Your words have really touched our hearts and, even writing this reply to you, feels strangely emotional. Yes, are we ready to live up to the challenge, that is the question since it is so true that whatever problems we have faced in the past saviours have appeared, some as if by magic, to make everything work out. Deciding which path to take is certainly not easy. Now we have a roof over outr heads, I'll pop over and give you a hand. Good luck. Thank you so much for your kind wishes. Given the difficulties of your own house situation at the present, we really appreciate your words of encouragement! They mean a lot. All help would be welcome! Your own projects have appeared to us to be far more daunting, we are seriously impressed. Oh, Jane and Lance, isn't it wonderful to have a dream? To transform this aged and mature jewel into the beauty of a former lifetime might require much money, much work and a twinkling of fairy dust.....but the love you hold for it will endure all. Can't wait to hear the final word! I have been waiting with great anticipation for your post. Oh my, the estate is magnificent and has so much potential. It also has many reasons to be hesitant. In cases like this, the mind has to be stronger than the heart. However, if the two can meet, and this is the right place and adventure for you, I wish you the best. I am so hoping that the surveyor has good news for you. Ah, yes, the Fairy Dust, we think that perhaps rather more than a 'twinkling' of that is required!! And, we are sure that you are more than aware of the acres of curtaining needed to clothe the windows of the principal rooms which are some 4m high....!!! Arleen, how right you are that we must, to preserve our sanities if not our bank balances, allow our heads to rule our hearts in this particular instance. The Kastély is beguiling, enticing, seducing even but we must not lose sight of the fact that even we can see through this rosy glow that there is much hard work involved in its restoration. We are quite certain, Jane, that you would love it all for it does, as you so obviously imagine, have such an enticing appeal and is certainly the closest we have found in Hungary to a house from a Molly Keane novel [something of which we have for long wished for]. But, in this case, we must be practical, or so we keep telling ourselves! What a thrill it would be for you to be able to see it with us for we are sure that it would weave its spell upon you too, and then what wonderful ideas you would have and what splendid suggestions you would make. Now we must await the turn of events. It's wonderful that there are so many talented craftspeople available in Budapest...one more thing...I forgot to mention how much I enjoyed your post title!! How really sweet of you to come back and to make mention of the post title. The truth of it we find somewhat alarming!! I, too, have anxiously awaited news of your weekend adventure into the manor. I am known for seeing the possibilities instead of the reality. And, I have found myself knee deep in hot water. I think if the surveyor has good news, can be trusted, and it is your hearts grandest wish, I can't wait to see it as it progresses. I know you will keep us posted. Dear Lance and Jane - I just wanted to say what lovely people you are. All these comments and you send charming, individual replies to everyone, and you kindly visit so many blogs too. Thanks you. Of course, as you so rightly point out here, there is always the possibility, and a very real one at that, of ending 'knee deep in hot water'. We do need words such as these for otherwise, what you say of yourself, could be so true of us. We shall, on this occasion, try to be sensible but your words of both encouragement and caution are so much appreciated. What can we say? The kindness and generosity of your words here have not only touched us but, not least because they were not necessary and need not have been written, have moved us greatly. Your words are not merely to be appreciated but to be truly treasured, and for this we thank you from the bottom of our hearts. What a grand opportunity, Jane and Lance. I have a quote coming up on my blog tomorrow which fits the bill nicely on this new, possibly life changing experiment of yours. Can't wait to see what you'll do with this property if and when it should become yours. I wish you all the luck in the world and all the joy inherent in a new adventure. Such great kindness. And such consideration of the moles who, if we are able to go ahead with the project, may well find that their comfortable lifestyle, as you suggest, will be severely, and hopefully permanently, disrupted as they are persuaded to pastures new. We shall look for tomorrow's post with eager anticipation!! Much good luck. I love the house and area. I have put so much money into my home, just repairing and not really changing the structure or ripping it apart and installing a whole new rooms (lived here during the repairs).... but I rather like where it is and just up-dated here and there.Can't wait for the up-dates ! You make abundantly clear why this house (and its grounds/location) are so appealing--and also what courage it takes and will take to see it through. Good luck with the surveyor. Most likely, Gayle, it is the crazy aspects of the whole project which appeal to us most of all. Almost certainly the whole idea is folly but, at least for now, in the planning stages, it is both exciting and fun. Your own house sounds most interesting and, like the majority of houses, something which continues to soak up money in the manner of a sponge and water!! But, as we are sure you will readily imagine, that since Saturday when we really did 'see' the house our courage has taken several knocks. Fortunately, for the most part, we seldom both have doubts about the entire project at the same time. Time will tell, as we keep saying to each other. I do not know what to say. I've been in a situation like that a couple of times at least myself and it is a difficult decision. The place has got all the potential to be a fantastic place, even a dream place (I do not now about the surroundings, that is important too) but certainly it will cost a small fortune to build and furnish it to the the right glamour and another one to keep it running at such. Time and problems too. It all depends on having the money first, of course, but then, and more importantly, if that is the best use for it really. I personally find your Budapest apartment charming and in a wonderful place and city and then I can imagine your Brighton quarters to be a fantastic arrangement for something of your taste and culture, to be able to keep in contact with England and all that it means for you. If I were you, and had the extra money too, I think I would better employ it in making what you've already got a real treat for you and your friends. I've braved this "advice" out purely of the affection I feel for you, as you already know. As our very first Follower you have been with us, through thick and thin, from the outset, something which we value and appreciate hugely. Your considerate, thoughtful and kindly expressed comment here we value as much, if not more so, for what is a genuine and truly caring consideration of our present situation. Not only are we deeply touched for the time and trouble which you have taken, but also are convinced that what you write is the voice of reason and to that we should, we know, listen most carefully. Please be assured that the advice which you give is taken in the spirit with which it was made and that we are more than grateful to you. Thank you so much. When or if we arrive at the cushion plumping stage we shall be sure to call upon your expert advice in that as in so many other matters. Indeed, will it be at all possible for you to put your life on hold for the next twelve months whilst you make a temporary office in the attic to oversee all Kastély operations? We fear that you could be right and we really cannot afford another addiction to the ever growing list! To be or not to be, well that really is the question! Full of potential! What an amazing property... I'm incredibly jealous. If it does work out I'm excited to hear about your plans for renovations and redecoration. What an amazing opportunity! Yes, we should certainly agree about the potential. We are sure that you must be one of very few of our readers who might actually give a thank you for this house. One does not have to be mad to do this sort of thing, but we are beginning to think that it might help! Gosh, what an amazing exploration, I'm almost dizzy in awe of the place from the tone of your words here. It look remarkable and true place from which you should reside, with of course your mad boy, if you ever manage to find him. Truly is a wonderful place. What a lovely place! Hopefully it can be brought back to life! Keeping fingers crossed for you! Breath-taking images of Kastely Hattatt. 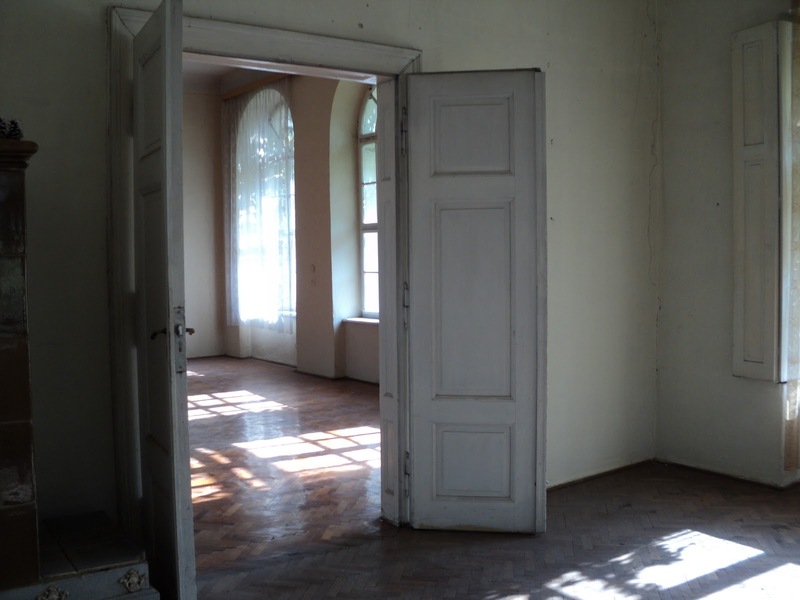 The dappled sunlight caressing the herringbone floors, the windows the doors and the sheer scale of the place. "I do not own Downton Abbey; I am merely the caretaker". Someone wise once suggested to us when buying to drive to the property at evening time (park) and sit in silence, in the car, for a couple of hours and really get "the feel of the place". What a decision. Fingers crossed. There is never a dull moment with the Hattatts. Oh Jane and Lance, what beautiful, sturdy bones in that house; it's lovely! I wish you well and pray for you both, each and every time I think of you...which is often. You're both so special to me; meeting you is a precious memory. I look forward to sharing time with you again, when we're brought together. It would be a commitment that would define your life, but when you carry the thought of it with every breath, think of the pattern of light falling across the floor and view the faint outline of a formerly glorious garden, well, then...Judging from the comments above, we are all on pins and needles. I must say, I am in love with this beauty, and I don't blame you for having such romantic vision! This is a dream home, to be sure. I do hope the surveyor comes through with promising news! Oh, what a journey this would be. I also would like to thank you so much for your visit. Your very kind words are truly appreciated. My mom was my best friend, and one of the most beautiful people you could ever meet. I am glad I could share a little glimpse of her spirit. The house is beautiful even with much work to be done. I can imagine it will be magnificent when it has been touched by your magic. Hoping the surveyor's report is not too frightening! Dear Jane and Lance, it would be a very big challenge indeed but one that I feel you would tackle with much grace, consideration, tact and diplomacy. I wish you all the best - may all your dreams come true. You are absolutely right. The Kastély would be perfect for the Mad Boy, especially as the two of us should be at that point completely mad too. A horse in the Drawing Room, we can see it in our mind's eye already!! So much is needed to restore the house to anything like its former self. It is a big question as to whether we are up to the task. Wise advice you offer here about soaking in the atmosphere of the place at night when in that stillness one's thoughts can clarify. We should certainly concur with the view that we are mere custodians of such properties and should do what we can to preserve them for future generations to enjoy. But, there is always a question of just how much can one afford to do and will it be enough? Such very kind thoughts, Sandra, for which we are truly grateful. Of course, you have seen how much we have already invested of ourselves into our present apartment and so, we are sure, have a very good idea at just how difficult this decision is. We too think of you and Dave often and are so happy to think that the paths of all four of us may cross again one day. We were delighted to see Dave looking so well in the helicopter!! Oh, Carol, we carry such images as you suggest here in our heads all day and most of the night! It is,we have to say, rather strange for us that a single house should be so consuming of our thoughts. Perhaps that is a measure of how much, as you point out, this decision could be a life defining one. Oh, Irina, and now we have you too beguiled by this sleeping beauty of a place. It is amazing what spells she works! We were enchanted by your last post and thought it to be a most beautiful tribute to your mother. Thank you for such a vote of confidence. We are very unsure about having the abilities to create the proverbial 'silk purse out of the sow's ear'. But, we shall see! The bones of the house are certainly most interesting and, as a result, we can totally see that an interior designer may well see it as a 'dream project'. In the cold light of day and viewed by two amateurs, it all seems rather daunting we have to say! So you're going through with it, I hope you two have a strong relationship, you will need that and bushel full of funds, perhaps several bushel fulls but I always like a challenge, it does keep one young and active. No, Linda, the jury is still out on whether we shall proceed or not. We fear that you could be right about the several bushels but, the price of a relationship, well, we should put that beyond everything. My dear Jane and Lance, I shall keep my fingers crossed. I can see why you fell in love with this house. It's so inviting and it has got a good Feng shui even when I look at these delightful pictures. Of course, it needs love and care but you know, I love things even if they are not perfect. It adds charms and characters. If one wants to live in a perfect house, one would live in a modern apartment. But these old houses are full of history and charm. I wonder if I might apply a position of a butler at your house if there is a vacancy ;) As a fan of Beverley Nichols' Merry Hall series, I feel this house might be a charming equivalent of Merry Hall. Thank you so much for sharing and I shall keep my fingers crossed for you both. Butler, oh dear me no, dear ASD, we should rather that you were a very regular guest!! Yes, we can definitely see the parallels with Merry Hall. 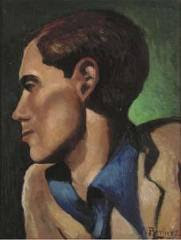 It is such a long time since we read BN, several novels of whom languish in our bookcase, that we feel this is a timely reminder for another look. Thank you for your kind wishes. We should certainly concur with your views about the 'perfect house', something which we should wish to avoid like the plague! I just noticed you put my name and the duPont Registry on your sidebar. I am speechless to be sitting at such right handed place of honour. Dearest Helen, it is just a small token of appreciation. We admire you and your work and are so happy to think of you as a friend. When the giveaway goodies arrive, there shall be a proper blogpost in right royal recognition!! As I said the last time, perfectly lovely! I do love antiques. When modern conveniences are installed and some parts are redesigned for your safety as you get older and with redecoration, the mansion would be the perfect last house of yours. However, if I look for my last house, I’ll be concerned about the environment – must be not only nice and quiet but also somewhat convenient, I mean not far from the markets, clinics, banks, and so on. Look forward to seeing how this will develop. Thank you for getting me excited, Jane and Lance. "Brave" is a word that does not begin to describe you Should your take this on! "Envious" is a word that does not begin to describe me when you succeed! -- regards to the surveyor!!! The charm of an old estate has never eluded me. Just luck of funds...Hope you have enough of them to turn this sleeping beauty slowly but surely in to the princess she appears to be. After careful consideration and a little what the heck..... of course! You will need both, the watchful eye and the carefree imagination. Wishing you all this and more... Can't wait to hear about the final decision. I had to smile at the piano nobile!!! My dear Jane and Lance, how are you bearing up? I have been reading through the comments, people say the lovliest things, don't they? It might all add to your confusion though. Whatever decision you arrive at, I am sure it will be the right one. My mum used to say, if you don't know what to do, take a step forward, it might not be the right direction, but you will be shown, by your action, which is the right way.I wish you all the luck in the world! I must admit to feeeling rather happy that you might be getting a garden. We are so pleased that you liked looking at the photographs. We are hopeless with a camera, unlike you, and so found it difficult to convey a real sense of the place. Dear Yoko thank you for your kind words. There is an ominous sound of finality about a 'last house' but you could well be right about that. Perhaps that is why it is so difficult to know what to do for the best? You are so right about the environment and there are certain issues regarding that very idea that we are trying to resolve at the moment. So much to consider...!! Brave is the last word we should use to describe how we are feeling at present!! We have ventured into the unknown before and come out on the other side stronger,wiser and, thankfully, in one piece, but we are mindful that everyone has his/her Waterloo!! Will we have sufficient funds? How deep is the Danube? So many imponderables fill our minds day and night. We do accept what you say about on the one hand having a keen eye on everything and, yet, on the other hand taking a flying leap. Caution, we fully recognise will not be enough to bring this project to a successful conclusion, but throwing caution to the wind is so very much more difficult in this, to us, very foreign land! Dearest Linda, if only you could be by our sides right now, how comforting that would be. We could all scream with terror and excitement at the same time and, after a few glasses of excellent Hungarian red, we could make a start on the Kastély, mops and sledgehammers in hand! We loved your idea of introducing red around your house and could well imagine you all on Christmas Day, red Nespresso bubbling away, jumping over the toadstools! Have you written your letter yet to Santa Claus? You are so right, Pam. This is something of which we could be sure as we have always felt so much closer to our various houses after 'making them our own'. We never have been able to have the absolutely brand new, no work to be done mentality. This post impresses me enormously. I think that one of the most noble things is to restore a house. If I had the means, I'm pretty sure that's all I would do in life. 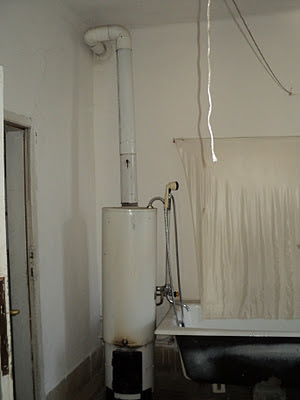 Since we are in the process of looking for a house, it is so painful to see the way other people approach restoration. Yes it is an early house with a later, grander addition. It is the principal house of the village and the facade is listed. Rather like a Grande Dame, the Kastély does, we agree, have good bones but is in need of a nip and tuck here and there to restore her former beauty!! We absolutely agree with you about the way in which so many older properties have been 'modernised' with a complete lack of sensitivity and feeling for age and period. 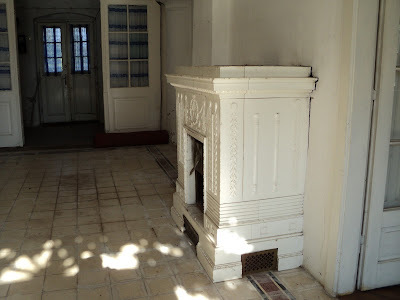 The appeal of this kastély is that, although in multiple occupancy during the Communist period, a lack of money in the past has resulted in little in the way of major change. It could be a wonderful adventure or a season in hell, but I'm betting on it being an adventure, no matter what it takes. Life should be an ongoing expansion and this would be a good way to ensure and experience that. Oh, it's wonderful. Warts and all. The architecture is beautiful. I love places with character and that has a lot of it oozing out of the masonry and everything else. Thanks for sharing the photos. I'm excited for you. We are so heartened by your comment, Teresa, and fully concur with your view of life as expressed so succinctly here of life as 'an ongoing expansion'. Alas, Mary, it is not just 'character' oozing out of the masonry which is why, in part, we remain in this state of indecision. We ignored some things that came back to haunt us here in our 100 year old building, your surveyor will hopefully catch anything you don't see as a potential problem. I am sure it will be fabulous afterwards. There is, as obviously you found to your cost, always something about an old building which will, usually unexpectedly, involve one in expense, most often when one least expects it. We really must be very clear in our minds as to what is involved before we finally commit ourselves. All the very best if you do decide to proceed - it will be lovely to watch the renovation on your blog. It is a house crying out for love and attention. What a wonderful project to take on. 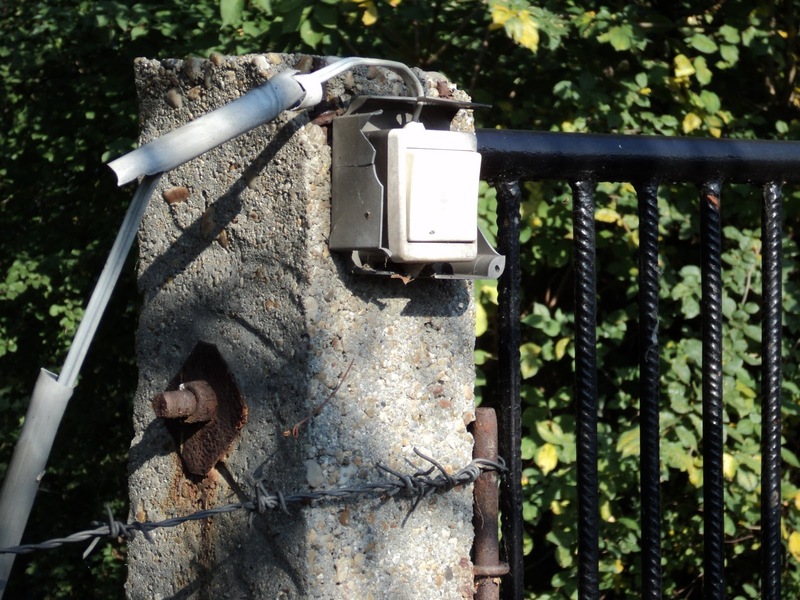 Lets hope the surveyor gives you good news. Beautiful parquetry. That house is ooozing potential. It is beautiful. But you are so right getting the surveyor in - a house in that state could be housing all kinds of horrors. I hope it isn't though ..... P.S. I am assuming that it is a house that you are considering buying? As yet we remain undecided although very tempted. We are concerned about the amount of work which is required on the one hand, on the other we are already, in our minds, arranging the furniture and hanging the pictures! The parquet flooring is indeed lovely. We have the same throughout our Budapest apartment and whereas in Britain it is less usual, and always fearfully expensive, here it is a very normal type of flooring with the dreaded fitted carpets being virtually unheard of. Yes, perhaps rather foolishly, it is in our minds to buy it as we really should like to have somewhere in the country and, at least of today, see ourselves dividing our time between Budapest and some far flung, remote corner of the Empire or, in this case, Motherland! Like you, we too enjoy letting our minds wander to the past occupants of the house, who or what they might have been, and how there must have been so many changes over the past 250 years. I am filled with admiration, both of your consideration of this amazing looking wonder, and of the way you so accurately describe real estate agents and their imaginings. I hope that your decision when you make it, is an easy one. In the cold light of day we think, most likely, it is utter foolishness but are cheered when people, such as yourself, so kindly and thoughtfully refer to it as consideration. Ah, estate agents - the same the world over! Thank you so much for signing as our latest Follower. We are delighted to welcome you. Oh Jane and Lance - I just love it but I am talking from the heart and not the head! I hope that the surveyor will be the bearer of good tidings. Such a beautiful building deserves worthy custodians such ad yourselves.